Spice it up with Saucy Chicken with Pinto Beans and Rice! 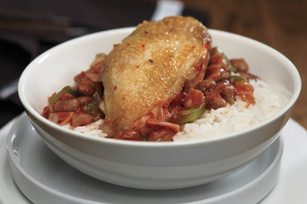 Ham and a jalapeño pepper add supporting flavors to this chicken with pinto beans and rice dish. Heat dressing in large deep skillet or Dutch oven on medium-high heat. Add chicken; cook 10 min. or until evenly browned, turning occasionally. Remove chicken from skillet; cover to keep warm. Add onions, bell peppers and ham to skillet; cook and stir 5 min. or until vegetables are crisp-tender. Stir in beans, tomato sauce and jalapeno peppers. Add chicken. Bring to boil. Reduce heat to low; cover. Simmer 25 min. or until chicken is cooked through (170ºF). Serve over the rice. Prepare as directed, substituting 6 small boneless skinless chicken breasts (1-1/2 lb.) for the cut-up broiler-fryer, decreasing the final simmering time to 10 to 15 min. or until chicken is cooked through. Prepare as directed, substituting black beans for the pinto beans and stewed tomatoes for the tomato sauce.